grenades, return of Fleet Admiral, bunnies, anfractuous patrol of MIT and environs, much chalk, hat mushroom, lots of chain drops and one flat, mixed results on scavenging, knighted Boost. 15 grenade-fueled pilots came out after an irradiated day for "Operation Persephone Something Something" said Fleet Admiral Skunk on the launch pad. "Isn't it operation Persephone Calling?" asked Leotard. "Spring spring! Spring spring!" chimed in someone else. Before launch, Pastry Queen christened new ship Persephone, which features an umbrella that won't actually keep you dry attached to the back. Snow then introduced babymaggot Ravensson, Antlers's brother. "Just wait till I get the third one in," Ravensson was heard saying. With Dr. Claw flying Bieber Fever at the head, the fleet flew off in search of various items on a long list that the Fleet Admiral had compiled. Some spectacular flowers were found painted on the ground on a quiet side galaxy shortly after launch. The fleet took an easy flight through Central and Harvard constellations, running into piranha on the way. Soon, we reached an unsavory snack stop, where many pilots availed themselves of Manta Ray's chalk bag to obtain Glorious Points through artistic renderings of things we weren't too likely to see. Lordmcfuzz's dance belt from last Life Day would have come in handy on a certain drawing of Hades. Wending its merry way through the maze of MIT listening to a mix of chopper groove and Summer of Love psychedelia, the fleet picked up a friendly Klingon. Chubz dropped chain, and the fleet stopped to fix the mechanical. Snow announced that it was now Mother's Day, and Antlers and Ravensson called their mom along with Tanager. About 100 feet later there was another quick mechanical stop, just long enough to observe a cute fluffy space bunny. The fleet soon reached a park near Memorial Drive where Pastry Queen knighted Boost, who kept an unceasing smile on their face through the whole ceremony. Harder than it looks. 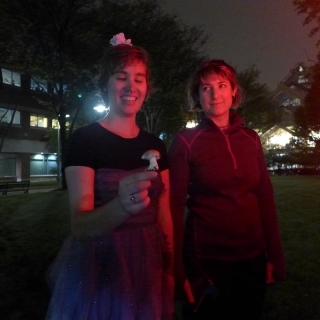 Those two also found a real mushroom in the park for Skunk to put in his hat. Flying back through Somerville System, Trinity's navigational thruster went flat. With help from Flatbag, Antlers, and Ravensson holding the huge ship steady, Leotard patched up the flat quickly while the Fleet Admiral looked for worms, worth a good number of points on Persephone's list. None were to be found, despite the day's earlier rain. We buzzed by couscous's fort to see if the distress call was still jumping, but all was quiet. So we flew casual home through Davis Constellation, with some pilots singing along with the Fifth Dimension's "Aquarius" at the top of their lungs. Back at the launchpad, Punchy (I think?) was awarded a Medal of Chic for their stylish springy outfit, and the mission was declared a success. Gimme those sweet, sweet points!